There is power in connection. Working together. Sharing the load. Reaching farther. Changing lives. I was taught to lead by example. Don’t tell people what to do, show them by the way in which you live your life. 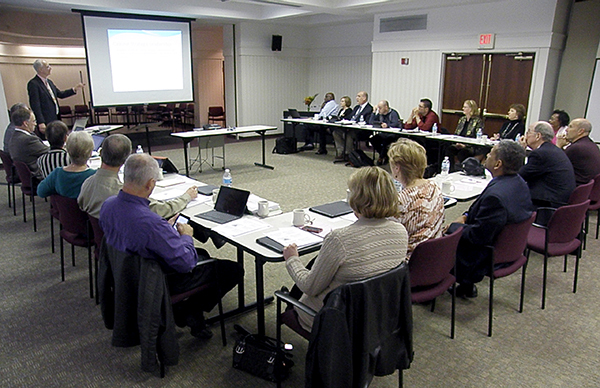 That concept of modeling for others was on full display November 5 in Worthington. 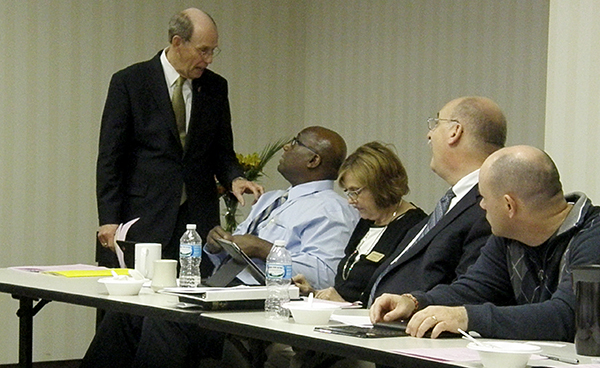 Bishops Gregory V. Palmer, of Ohio Area West, and John L. Hopkins, of Ohio Area East, convened a joint meeting of their extended cabinets. It was a day of fellowship, friendship, and unity. The day began with worship and communion in the West Ohio Conference Center. The remainder of the morning was spent with members of each extended cabinet highlighting the ministries and initiatives that are shaping their respective conferences. “The quality of leadership of both cabinets feed off each other as we study best practices and work together as a team,” said Hopkins. The energy in the room was palpable as examples of successes, and the lessons learned from well-intentioned missteps, were shared among colleagues in Christ. “I see hope because we are working together to understand the Spirit,” said the Rev. Steve Court, dean of the East Ohio cabinet. The morning business session adjourned from the conference room to intimate tables for lunch. No high school cliques here. No boundaries drawn. The air was filled with stories and laughter as followers of Christ fellowshipped with one another. While the morning focused on the here and now, the afternoon was devoted to the future. The latest Pew Research Center poll shows that “one-fifth of the U.S. public – and a third of adults under 30 – are religiously unaffiliated today.” That is the highest percentage ever. In order to effectively reach those individuals it’s important for leaders at all levels of the Church to have a plan and be well-trained in executing it. The topic on this day focused on clergy leadership. The two cabinets collaborated on the best methods for recruitment, deployment, and supervision of clergy. Fear of the unknown has stopped each of us from trying something new at some point in our lives. On this day, leadership from two conferences came together to model the benefit of collaboration. We all have the same mission, to make and mature disciples of Jesus Christ for the transformation of the world. We can each choose to do it alone, but there is power in connection. Next post12 Years a Slave is a remarkable, beautiful, and devastating film that is a testimony to the dignity and hope of the human spirit in the midst of persecution.